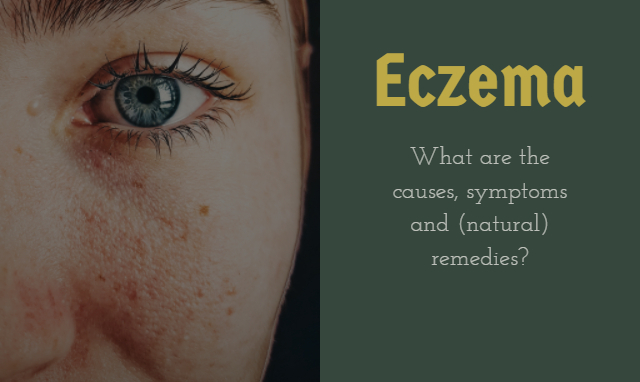 Eczema: What are the causes, symptoms and (natural) remedies? Skin problems are common among human beings. Eczema is one such skin problem that can turn your skin red and itchy, and the more you scratch it, the more irritable it becomes. Eczema is common in kids and can be treated if taken care of properly. However, a permanent cure for eczema has not yet been invented by doctors. It can flare up at any point in time. With age, a child’s eczema goes away, but adults, too, have been diagnosed with this disease. Eczema is manageable if treated properly. The most important thing that you to do is to find out what triggered eczema which leads to the red, itchy and inflamed skin. After determining the cause of eczema, you need to act on it. There are various remedies depending upon the kind and severity of the eczema that you have. Eczema can be classified into various types, namely, contact dermatitis, nummular eczema, atopic dermatitis, seborrheic dermatitis, dyshidrotic eczema, stasis dermatitis, and hand eczema. They can range from mild to severe. Treating eczema is very important. As proven by the medical records, there are no specific causes of eczema. Doctors are yet to determine a particular cause for the disease. For some, it may be due to a deficiency in nutrients, and for some, it may have occurred due to exposure to some irritant or allergen. It may happen when your immune system dysfunctions. It is also transferred down the line by genes. Variation in the genes affects the skin which can result in eczema. The environment plays an important factor, and the environmental conditions can cause eczema. Change in temperature can also cause or trigger this disease. Sensitive and dry skin is prone to eczema as it cracks more and is prone to diseases. Defected skin can also cause eczema as it allows the moisture to seep out and allows germs to enter the body. Allergic reaction to certain things like beauty products, food, chemical allergens, or detergents may also cause eczema. Stress or more specifically chronic stress can also lead to the development of this disease in humans. Since it is known that eczema is a genetic disease, it does run in the family. According to the doctors, children who have been diagnosed with eczema are sure to suffer asthma or some other kind of allergy in the later years. The disease is not contagious. Eczema does not spread when touched. Skin to skin contact has nothing to do with this disease. Environment plays a very important role in the development of the disease. Exposing a child to the higher level of pollution or people living in cold climates has higher chances of having eczema. The disease is not caused due to an allergic reaction. It is a common misconception that eczema is caused due to an allergic reaction but it is not so. But you do have to abstain from taking food items that may cause a problem due to eczema. The first and foremost thing to keep in mind is that eczema in different people is different. It may vary from individual to individual and can flare up at any part of the body at any time. The usual symptom to look for is itching. Eczema starts with the itching; it can vary from mild to moderate for most individuals. But there have been occasions when the inflammation has gotten worse, and the itching gets so irritable that all you can think of is scratching your skin and it bleeds, too. Coconut oil is a great remedy that can relieve you of the itch that is caused due to eczema. Try putting coconut oil on areas that are dry and are inflamed. Coconut oil helps reduce the inflammation and relieve you of the itching. Vitamin D is a great solution that can help you with eczema cure. Along with exposure to sunlight, which helps a lot too, eat food supplements that are rich in vitamin D like salmons, cod liver oil, sardines, raw milk, and egg. Baths that you take matter too. It is known that the Dead Sea helps in curing skin problems. You can substitute your bath salts with the Dead Sea salts and nurture your inflamed skin in the bath. This helps in reducing the inflammation and redness and provides a protective barrier to your skin. Do not rub your skin but do pat dry it. Apply itch cream on the areas that your doctor might have suggested. When the condition is in a mild state a cool, you can use wet compress can be used to relieve yourself from itching, but if the blisters have turned worse, it is better not to use it. Probiotics help reduce inflammation in kids. Women who take probiotics during their pregnancy are likely to prevent the development of eczema in their child. Lavender essential oil helps reduce the side effects of eczema like depression, lack of sleep, anxiety, etc. Vitamin E and witch hazel help in the treatment of eczema. They help in reducing the itch, and use of Vitamin E ensures that the area does not scar. Eczema is common in children and you can cure it with care and attention. However, just don’t assume that you have completely cured it and be aware that it can flare up anytime. Taking good care of your skin along with a healthy diet can relieve you of the problems that eczema causes. Hey, I'm Jane and I love to live frugally! I am keen on taking care of myself (both in terms of internal and external health). I care for the wellness of my family and want to leave a green earth to the coming generations. Find out how you can make use of my interests for your good by reading this blog.